I love this mattress! I can finally get a full nights rest. I love a soft mattress, the less firm- the better! And this bed is like being hugged by clouds. Without a doubt I would buy this product again and again!! This is my second mattress and will be purchasing another one soon for my guest bedroom!! I love the brand. The bed still need to be "broke into". Great sleep. Comfortable. And size is right. Love having to sleep well! After so many years of use it does get uncomfortable. I love pillow tops for my bad back it really helps me sleep better. 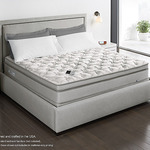 My last mattress was 10 yrs old.I took my time and looked around before making a decision.This mattress was the only one that when testing no pain came to my back.I have been very pleased with this mattress.I will buy another Sealy for my future mattress. We got this mattress for our primary bed about six months ago, and have been pleased so far. We had a Sealy before, but had a much firmer mattress than this pillow top. It's a good blend and is soft while giving enough support. It also stays relatively cool, and the material seems to be of high quality. The only concern I have is that it has started to dip where we sleep on our sides of the bed. It hasn't created any issues yet, but I could see that being an issue in the future. Does this really get posted? This is the most uncomfortable mattress ever! We first purchased this mattress about eight years ago when I was pregnant with my first daughter. The mattress we had been using was a hand-me-down from my aunt that was about 20 years old. I was super uncomfortable being six months pregnant so we decided to go out and purchase a new mattress. We were due for one anyway. Let me tell you that this mattress did not make my night any better. I was still uncomfortable, but I attributed that to the fact that I was pregnant. But months later, I was still uncomfortable. Now eight years after owning this Sealy Posturepedic Pillow Top Mattress, it is actually excruciating to sleep in this bed all night. I usually spend my nights on the couch. The only time I sleep in the bed is when the baby is cranky and needs to sleep with me because the bed provides more space than the couch does. I will never buy a pillow top mattress again. They cannot be flipped and rotated the same as a traditional mattress. Thus, the bed wears out more quickly because the weight cannot be evenly distributed by flipping. The springs all wear out in the same area. There is a dip in the middle of the bed that you are always pulled into. Mind you, my husband and I are not large people. The bed should not wear out this quickly. I would not suggest this mattress or any pillow top mattress for that matter. My husband and I bought this mattress years ago when we were in need of a new mattress. My husband always does his research before buying anything and this Sealy Posturepedic Pillow Top Mattress got great reviews. I will say buying this mattress was money well spent. It's very comfortable and soft while at the same time being firm. 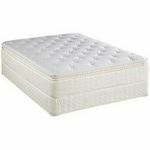 It's just soft enough to be really comfortable like sleeping on a cloud but firm enough that you feel supported. I notice when we travel away from home we always can't wait to be back home and in our own super comfortable bed. My husband has a bad back and this mattress has always been very comfortable even for him. One thing about this mattress is you have to buy sheets that are deeper. Regular sized sheets don't really fit this mattress because of the extra padding from the pillow top. I would highly recommend this mattress to anyone looking for a long lasting comfortable mattress that is firm enough to support you but also soft enough to feel like you are sleeping on clouds. Comfort Very comfortable, it's soft but also at the same time firm enough for support. Support While it has the soft pillow top it still has great support. My husband has a bad back and needs the extra support and this mattress has worked very well for him. 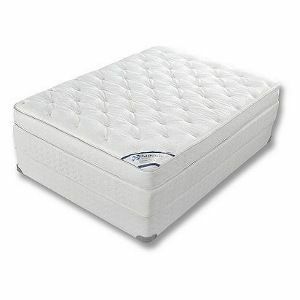 Firmness Has a nice amount of firmness without compromising the softness needed for a good nights sleep. Durability It has lasted us many years and withstood several moves. 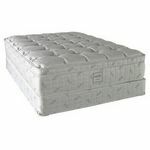 The mattress has a nice balance between a hard and soft mattress. Soft when first going to bed but firm and supportive for a good nights rest. UPDATE. After months of using this bed it is still as comfortable as the first time I used it. Has not developed any of the humps and dips other matteress I have had did in the same amount of timeframe. 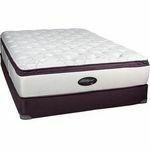 Downside is the price it is fairly high for a standard coil bed these days and while it is still good and I like it also the fact that sometimes the "proper" size sheets are VERY tight to get onto the bed. I would encourage the use of a matteress pad with this otherwise there may be some staining to the pillow top. Comfort Comfortable for me and my partner who prefers a softer bed. Support Nice even support without any pressure points. Firmness Soft enough for my partner firm enough for me. Durability Had another one of the companies mattresses for 10 years, expect the same from this one.